Az ár tartalmazza a szállást all inclusive ellátással, a repülőjegyet illetékkel, kézipoggyásszal és a transzfert Törökországban, Antalya repteréről a szállodába és vissza. Nem tartalmazza az idegenforgalmi adót, amit csak a helyszínen lehet kifizetni. A keresés gombra kattintva testre szabhatod az utazást. A foglalás gombra kattintva így, ahogy van, lefoglalhatod, csak befrissítjük az árat, mert az változhat, ahogy a repjegy vagy a szállás ára változik. Antalya is the largest city on the Turkish Mediterranean coast, and is one of the hubs of the so-called Turkish Riviera. 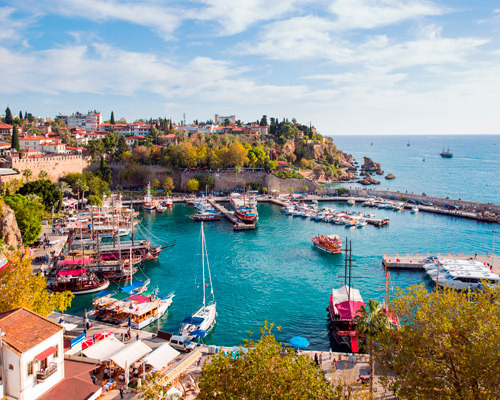 Having the most beautiful and the cleanest shores of the Mediterranean, along with the long coastal line of Antalya, one encounters antique sites, old ports, monumental graves, dramatic shores, endless beaches, green forests, rivers and waterfalls. 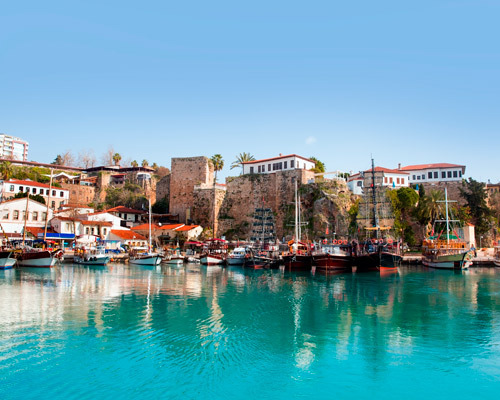 Kaleici, enclosed in ancient city walls, is Antalya’s Old Quarter. It is one of the liveliest parts in the city with shops, bars, restaurants and entertainment facilities. The streets of Kaleici extend to the old harbour, which is used as an international yacht marina today. In the picturesque Old Quarter, you’ll find examples of Hellenistic, Roman, Byzantine, Seljuk and Ottoman eras and numerous archaeological cities and historic buildings to explore. Antalya is an attractive city with shady palm-lined boulevards, considered by many as a paradise on earth and the pearl of the Mediterranean. Not bad, huh?